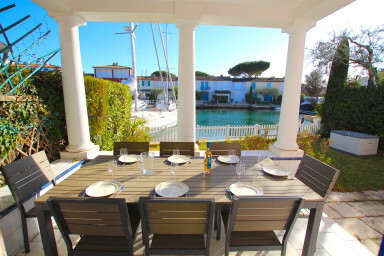 A large cosy house in a very private area close to Port Grimaud 1. Wide house on 2 floors in a private very area close to the center. It has been recently redecorated and will charm you with its size and its garden. - on the 1st floor: a large master bedroom with a double bed, a private bathroom and a terrace with a lovely view, a bedroom with 2 single beds, a bedroom with a double bed and a bathroom. On the canal side, a terrace with typical columns and a garden with a barrier. In front of the house, a 12m x 5,50m mooring. A numbered parking space with a roof close to the house. The bed linen and towels are included.